Manufactured by the Topps Gum Company, 1952 Topps Baseball is considered by many collectors and baseball historians to be the most important post-war baseball card set ever produced. 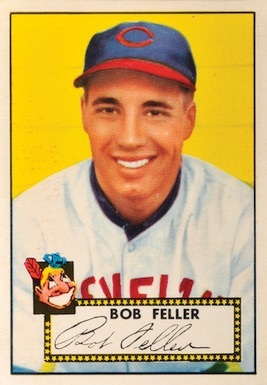 The vision of Sy Berger and designer Woody Gelman, '52 Topps ultimately earned Berger the nickname, " The Father of Modern Baseball Cards." 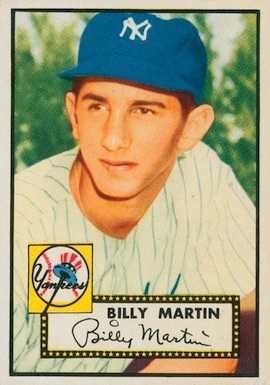 The 407-card set was the largest set ever produced at the time of its release. 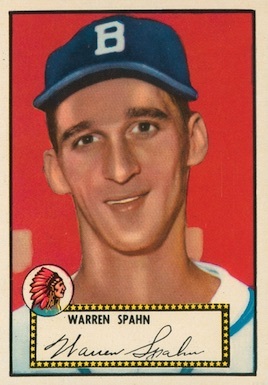 Representing a complete turnaround from the company's ill conceived product and design concept the prior year, the 1952 Topps Baseball set laid the foundation for what would become the modern trading card. 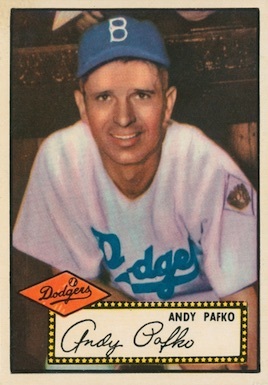 In addition to the larger checklist, the design of the cards themselves featured full team logos, colorized black-and-white photography and most interestingly, a facsimile signature of the player taken directly from their player contract with Topps. 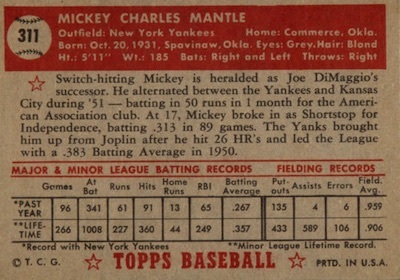 The card backs featured statistics and biographical information about the players, a component that would become very important in helping to connect the depicted players with their targeted market, children. Many collectors can attest to the fact that the backs of trading cards not only helped them learn about their favorite players, but also made rudimentary educational skills like reading and math a fun and tangible part of their collecting experience. 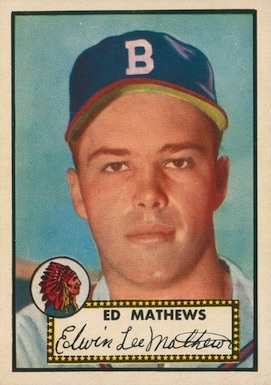 As was common at the time, the 1952 Topps Baseball set was produced in six different series. 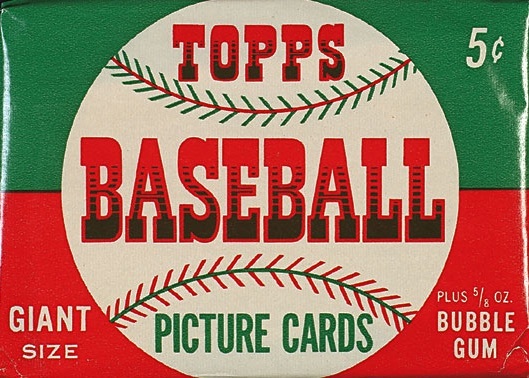 Conscientious of costs, Topps would produce the later series cards in a much shorter quantity due to kids returning to school, the baseball season ending and sports fans attention turning to football. In an effort to bolster sales, it was also customary to hold back the production of some popular players until a later series. 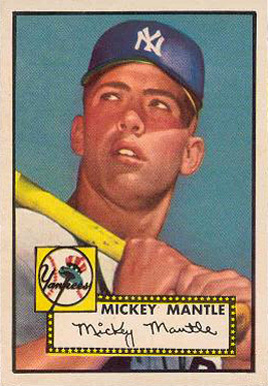 As a result of this practice, the key card in the set and by far the most valuable and recognizable, is the rookie card of none other than Mickey Mantle which appears as card #311 on the set's checklist. When the hobby went through its resurgence in the 1980s, it was this set and the Mickey Mantle card that helped spark the era of over-production. This came about as a direct result of economic conditions faced by Americans at the onset of the 1980s. Wealthy individuals began to hedge their assets from hyper-inflation by investing in tangible goods like gold, art, and yes, even baseball cards. When Mickey Mantle rookie cards in mint condition hit the auction circuit and saw realized prices of tens of thousands of dollars, it seemed everyone wanted to be the one to cash in on "the next" Mickey Mantle. As most collectors know, the perfect storm that resulted never really panned out to anyone's expectations. No one but the Yankees' scouting department could foresee just what a legendary figure "The Mick" would become, not even the set's architect, Sy Berger. It's been long said that Berger, stuck with several unsold pallets of high-numbered series cases, dumped the cards into the Hudson River with a forklift. This disturbing fact haunts collectors to this day, knowing that one of the most valuable baseball cards ever made likely has several dozen examples entombed in a watery grave. Distributed in packs of five cards for a nickel, it's amazing to think that at one time, these pieces of cardboard treasure cost just a penny a piece. The simple nostalgia that is generated by this set of baseball cards stretches well beyond heavily invested veterans of the hobby. With its iconic design and deep-seeded checklist of some of the game's all-time greats, 1952 Topps Baseball cards have come to define not just an era of collecting but a simpler time in American history. 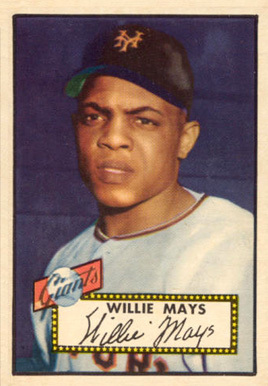 Transcending sports, many of the players depicted in the set became true icons of pop culture during the 1950s. 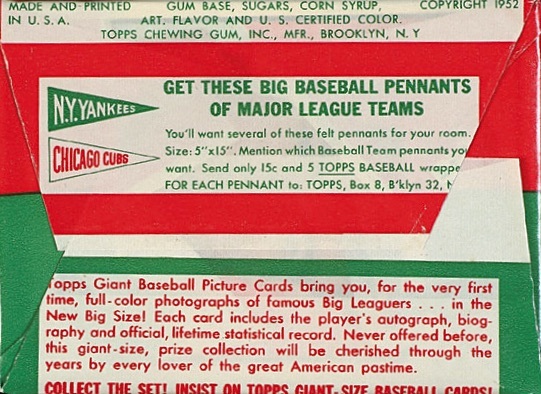 While scarcity, condition and desirability are all primary factors that account for the popularity and value of 1952 Topps Baseball, other issues play into and account for its longstanding appeal. Filled with oddities unique to the set, variations of several different cards exist giving rise to an even more intricate chase for master set collectors. 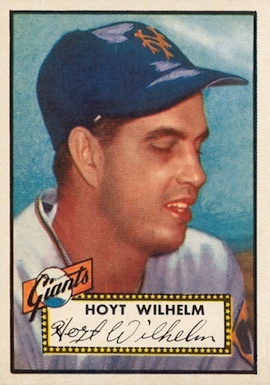 For example, due to these variations that include several different printing errors, there are actually 552 total cards to be found in completing a master 1952 Topps set. Some of the variations are in such short supply that it is almost impossible to accomplish this enormous task. Some of the nuances are easily spotted, as is the case with cards #131 to #190, which can be found with both white backs and gray backs. Others aren't as easily noticeable. 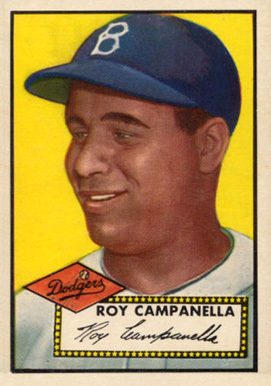 Take, for instance, Frank Campos' card (#307). 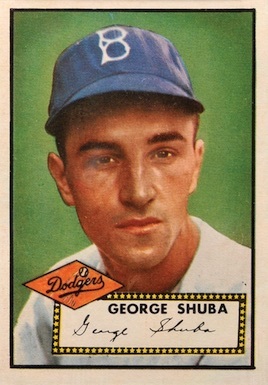 Just below the stats, towards the bottom of the card, the typical red star to the right of the words "Topps Baseball" was printed in black. A minuscule difference, but the card is considered a legitimate variation nonetheless. The card actually sells in the mid-five figures on the secondary market during the rare occasions that it surfaces. Other valuable 1952 Topps Baseball variations include the error cards for Joe Page and Johnny Sain. 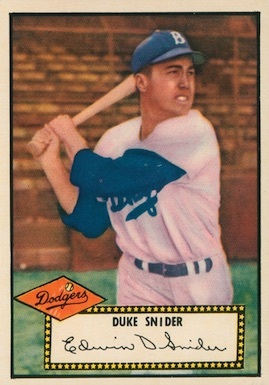 The bio portion of the card backs mixed up the two former players, but there is a more common version for each that features the correct backs. In total, there are 145 total variations, or more than 25% of the standard 407-card set. As a result, you could write an entire book on the subject. 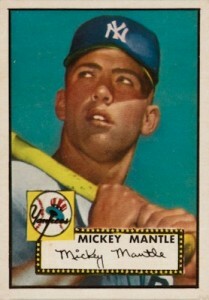 Not even the venerable Mickey Mantle card escaped the gremlins of the Topps printing presses. 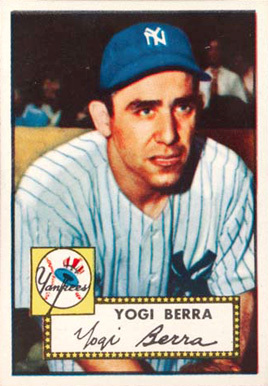 His card variation includes the following identifiers: darker skin tone, a white printing dot alongside the left border, no black border around the Yankees logo, and the last "E" in his signature ends with the line pointing down. 407 cards. Shop for base cards on eBay. Short prints (SP) are noted below. 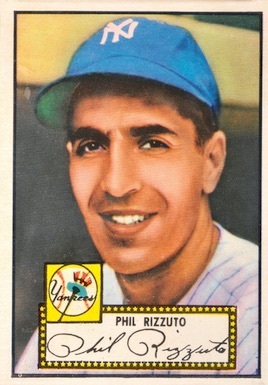 1952 Topps Al Brazle – #228 PSA 6! Red Back Cardinals! 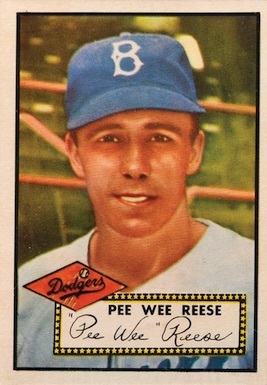 1952 Topps Wally Westlake – #38 PSA 7! Red Back Cardinals! 1952 Topps Paul Minner – #127 PSA 7.5! Red Back Cubs! Still my favorite set of all-time! 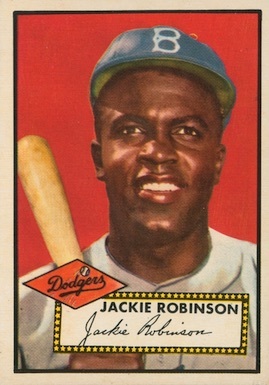 The Jackie Robinson and Mantle are especially beautiful. The 1952 Topps set is the most difficult of all Topps sets to complete, with different levels of scarcity (#1-80, 81-250, 251-310, 311-407). There are a few stars lacking in this set (Kiner, Musial, Williams, among others). Only those lucky few who have deep pockets can afford to complete (or buy) the set.